The second CicLAvia is upon us. On Sunday, 7.5 miles of city streets will be turned over to bicyclists and pedestrians for their safe enjoyment. Along the route there will be plenty to see and do, with planned activities and celebrations, great restaurants, historic sites, and shops and other venues welcoming walkers and riders. 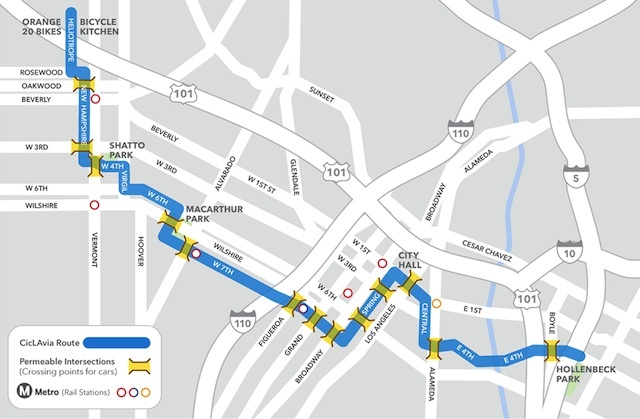 Where to go: CicLAvia has a map you can download and print, as well as some information about how to access the route, including by transit. What to see: There are a couple of great lists circulating online of things worth checking out, including one we talked about last week from the HuffPo, and one shared by local blogger Militatnt Angeleno. What to eat: Another local blogger, EatingLA, has put together a list of some great places to eat along the route.